This Post is the review of the WordPress plugin, Thrive Headline optimizer. I have been using the plugin for the past few days for testing purpose. I will be reviewing some products before it's official launch and this plugin is one of it. I won't write a review post of all the products I test personally. 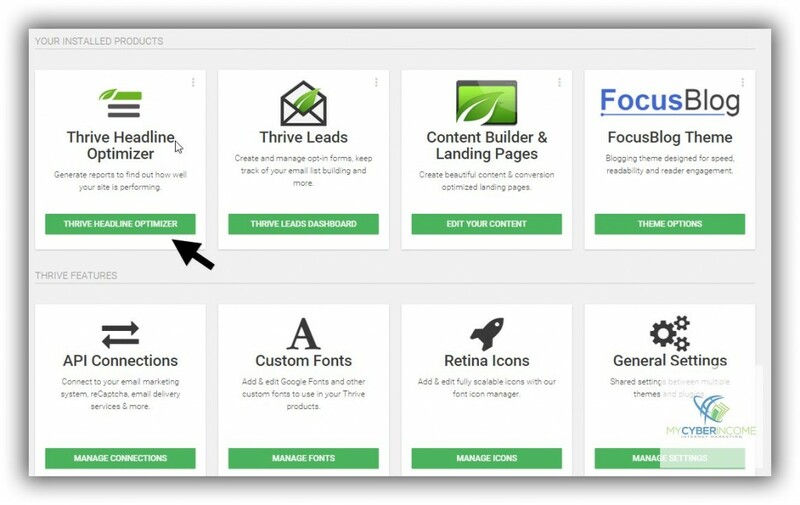 But after using this plugin for a while, I thought it should reach my visitors and so, this report on “Thrive Headline Optimizer” was written for you. Let's go straight into the review of Thrive Headline Optimizer. If you've checked my Thrive Themes Review, and I'm getting excited day by day because of their continuous support to the theme. With the hope, I started testing Thrive Headline Optimizer for the past few days, and I will tell you how the plugin works, improves the headline clicks through this blog post. 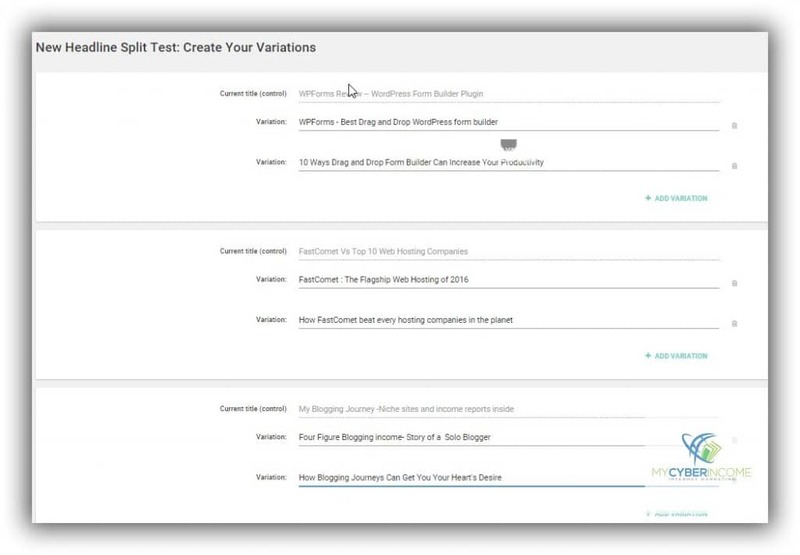 Thrive Headline Optimizer gives the site owners an easiest and most powerful tool for testing which includes split testing, thus improving the effectiveness of blog posts headings by making them more click-worthy. Headlines are the fastest and easiest way to get clicks on your blog posts. Viral Nova like viral sites gets millions of clicks just with the help of headlines. Headlines are the most powerful thing, and everyone should optimize themselves to get more success with their blogs. Thousands of free social signals. Think about the content marketing craze present in the internet marketing world right now. Thrive Head Optimizer perfectly taps into this trend because testing and improving headlines is the number 1 greatest point of leverage for improving your content marketing. Every business needs traffic and here is the plugin to bring you that traffic with its most advanced inbuilt title optimizer plugin. This is not a regular A/B tests you find with other products. While other headline optimization plugins base their suggestions on share counts and other EXTERNAL factors, this one is different. Think about it. If your headline is shared by someone with 100 million followers, it's going to be massively successful, REGARDLESS of the headline. External factors make it impossible to accurately predict headline performance. 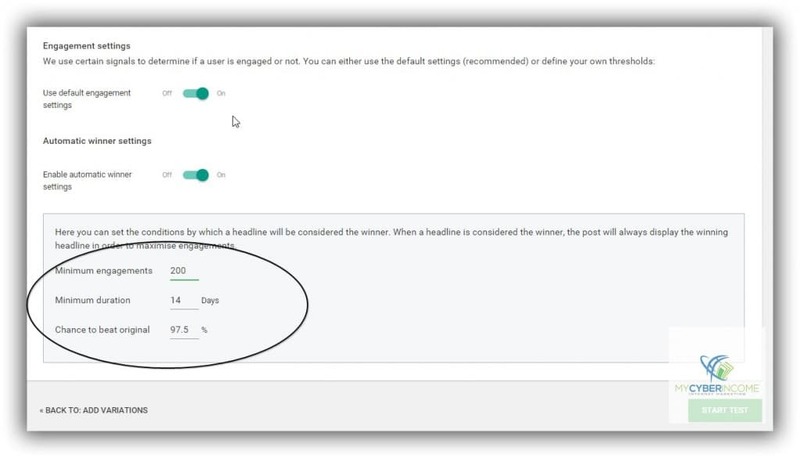 Thrive Headline Optimizer uses internal measurements to see which headline will perform best. The plugin considers real time visitors and their clicks. If your site gets thousands of visitors per day, then the plugin analyzes their behavior and provides accurate information about the clicks made by them. The plugin analyzes all the clicks made by those thousand visitors and finds the best suitable headline for that particular blog posts. See there are no external factors involved in it and thus, Thrive Headline Optimizer becomes the most accurate headline optimizer plugin on the planet. No other tool provides such accurate reports as far as I know. 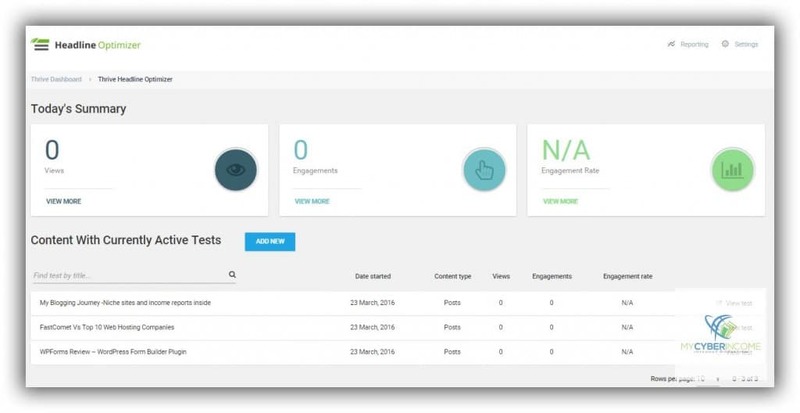 I compared the Engagement reports of Thrive Headline Optimizer with KingSumo plugin which is another headline optimizer plugin. I already said you Thrive Themes contains one of the best user interfaces for its products and you can understand it right now. You can add a maximum number of a new headline for particular blog posts. For Example, I added three headline variations to test a blog post, and I mentioned it in the below paragraphs. Those three headliners will rotate under various circumstances as you made in settings and the plugin choose the winner title out of it. It automatically finalizes it and makes it as the final one. You don't need to spend your valuable time testing each time with each title. Let's set it and forget. Dude, this it Thrive Headline Optimizer and it optimizes all the posts present on your blog. You can test everything with a single click. As said earlier, it is easy to use the plugin with simple three steps. Finalize settings and click done. For your convenience, I have added how to use Thrive Headline optimizer in the below paragraphs. Suppose there are three variations of titles named as X, Y, Z. If a person visits a blog post by clicking title X and another person visits the post by clicking title Y. The plugin analyzes how much time one visitor is spent on clicking the headings X and Y separately. The plugin calculates which title is engaging more with it. 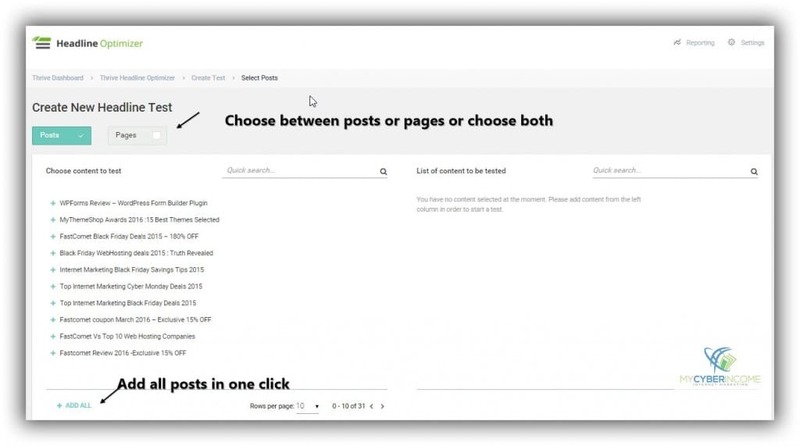 Think about your post getting 100 visits per day by two different headlines and the plugin analyzes all the timing of the users. This is huge; I bet you get the best intriguing title. If 500 visitors are visiting through three titles to a single blog post, the plugin analyzes the user's scroll depth to measure the power of headlines. The plugin analyzes the click-through rate of the headline variations. Thrive Headline Optimizer considers all the three measurements to find the best blog post headlines for your blog posts. Thrive Themes always knows its best pricing strategy. As a blogger, I know how it influenced pricing in WordPress themes market making other themes developers to reduce their theme prices. Thrive Headline Optimizer is priced well low for the first time launch and gradually will increase after sometimes.The lower price is to create a buzz in the industry which also helps bloggers and internet marketers to save huge money. As the launch of Thrive Headline Optimizer is happening, Thrive is planned to provide discounts for membership accounts too. If you are already a member of thrive themes and looking to upgrade your account, then it's the right time. You can check out my favorite Seven Thrive products along with Thrive Headline Optimizer. 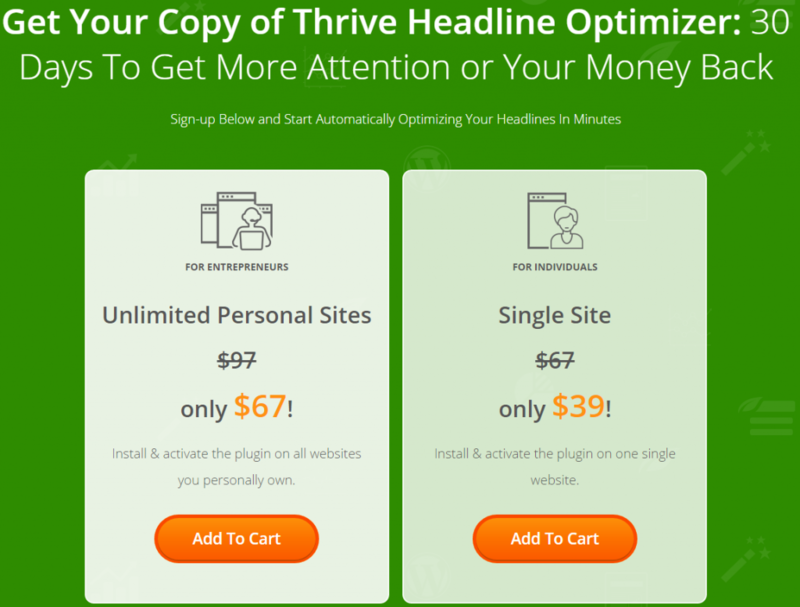 Once you bought using this link, install Thrive Headline Optimizer plugin and enter the activation key to activate it. Once you enabled, you can find a link named Thrive Dashboard and clicking it; you will find it. As far as with Thrive group of product, you don't need to worry about the clutch user interface you get with some other developers. Thrive Headline optimizer was neatly designed which enables a simple 3 step process for headline optimization. Once you clicked it, you will get a simple menu displayed below. Step 1: Click Add and it will take you to the next step. When you click reporting, it shows all the reports in a single dashboard. It shows which title gets maximum clicks and some more reports. I chose three posts for Headline optimizer and added two different titles for it. Once done I moved to the next page, where you can find full settings for the Thrive Headline Optimizer. Step 3: Since the plugin is new and, I choose to use the default settings as circled above. You can make any changes as per your wish. Finally, the dashboard shows the results. I added the screenshot once I finish choosing the titles. Once it started showing results, I will update it with more screenshots ( check results below ). If you are planning to write a new blog post, you can directly find the option to add new title variations in your WordPress post editor itself. In addition, it also shows the detailed reports in the right side(Since this post is in the draft while taking a screenshot, it's not showing up anything. 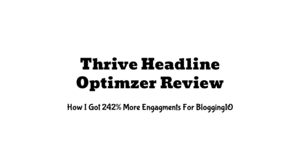 This is how Thrive Headline Optimizer worked out for me. 3. How FastComet beats every hosting company in the planet. The third variations are getting 240.98% improvement over the original headline and it has 100% chance of beating the original headline. I was associated with Thrive for a longer period and once if they introduce a new product, then it will be first of its kind or it will be the better of already existing products. When it released Thrive Leads, most bloggers started using it by eliminating all other lead generating plugins and now it the most successful lead generation WordPress plugin in the market right now. Like that, I expect Thrive Headline Optimizer will make a complete makeover of how the industry looks into winning headline optimization plugins and be one of the early users by utilizing this most advanced plugin before everyone and Start to receive the terrific traffic for your blogs. Detailed explanation..! Thanks for sharing this great Information..